This website is a bit of an experiment for me. To be honest, most things in my life are a bit of an experiment these days, and that includes beekeeping. I grew up in southwestern Pennsylvania, in the foothills of the Alleghany Mountains. Much of my early childhood was spent out of doors, exploring the woods and nature. The love of nature acquired in childhood has stayed with me, even through my many years in high tech. My maternal grandparents were farmers for many years of their lives and my grandmother kept bees for at least some of the time they farmed. So maybe there is a beekeeper trait that got passed down to me. If so, it skipped a generation because my mother, aunt, and uncle didn’t keep bees as far as I know. I’ve been interested in bees (all kinds really) for much of my life and started to formally learn about honey bees and beekeeping in about 2008 while living in Austin, Texas. The Williamson County Beekeepers were a great group to begin with and I learned much from them. After moving to North Carolina in 2010, I attended the Forsyth County Beekeepers Bee School and became the beekeeper at a friend’s farm in Pilot Mountain where we shared the bees. I currently have hives in Summerfield, NC at the Gate City Harvest Farm. You can learn more about my apiary — Lazy Creek Apiary — at this link: The Apiary. I am currently a member of the North Carolina State Beekeepers Association (ncbeekeepers.org), the Surry County Beekeepers Association (surrybeekeepers.org), the Forsyth County Beekeepers Association (forsythbeekeepers.org), and the Guilford County Beekeepers Association (guilfordbeekeepers.org). I’ve served on the board or in an appointed position for both the NC State Beekeepers and the Surry County Beekeepers. I’ve been an official mentor for students attending the Forsyth County Beekeepers Bee School for the past two years. 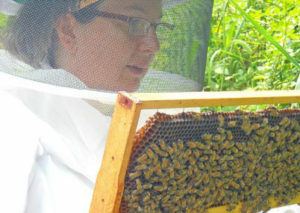 I’ve taught bee classes in Greensboro and a special class at the Surry Community College in Pilot Mountain. In addition to students from Forsyth, I also mentor a number of newish beekeepers and collaborate with a number of long time beekeepers. I attend state conferences when I can, listen to webinars like those that were provided by Dr. David Tarpy at NC State University or the current ones being hosted by Bee Culture Magazine (The Kim & Jim Show). I read something about beekeeping pretty much on a daily basis. You’ll see me in the bee yard during good weather and I’m always happy to share my love of beekeeping with anyone who asks (warning: this could take a while! ).